There is seaside golf, there is lakeside golf, and then there is Lake Superior golf. And that means a round at Superior National near the tiny winter ski village of Lutsen, Minnesota, on the largest of the Great Lakes’ wild and beguiling north coast. It’s the only full-length course — two nines open now and another by fall 2017 — between Two Harbors, some 60 miles to the southwest down Highway 61, and Thunder Bay, Canada, about 100 miles northeast. 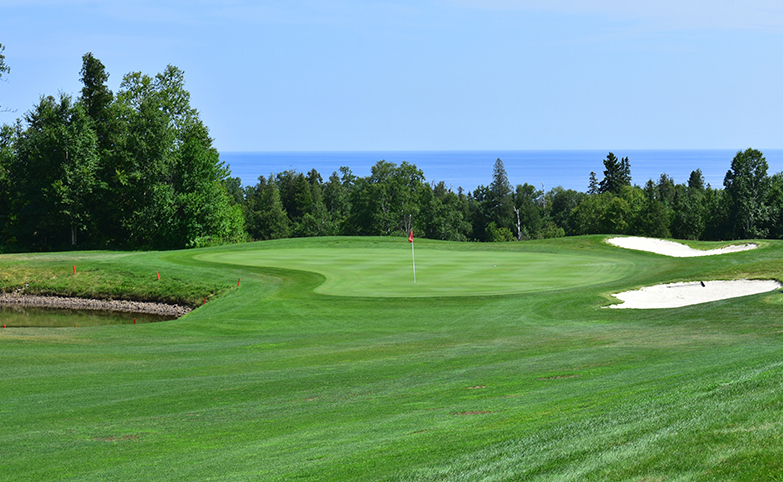 The window to play Superior National is small — late April to mid-October — but summer weather makes up for it. Temperatures reach the high 70s to low 80s well into August, with lower humidity than downstate, and on a recent Golf Tips visit, skies were blessedly blue. Shorts-wearing golfers were out in force, soaking up the sun as they made their way through tumbling corridors of bright turf and dense North Woods on the lower reaches of the Sawtooth Mountain Range. They reveled in the vast lake views and chattering wildlife, from chipmunks to deer. They grabbed hot dogs and burgers at the turn between the Mountain Nine, which vaults toward the ski slopes visible from the first tee, and the newly renovated River Nine, which hugs the Poplar River for most of its run and traverses it on the sweet par 3 second hole — waterfall right, green beyond and pure Minnesota beauty all around. One couple came all the way from California to play the course with their Minnesotan friends. After all, golf is a rare bird in these parts — especially golf that is anything but Midwest flat, with elevation changes you’d find in Colorado or the Sierra — so the chance to enjoy its charms and challenges for a few hours between, say, hikes on the Superior Trail or a fishing excursion onto the lake itself — shouldn’t be ignored. But wait, there’s more: A third nine, the Canyon, is in the final throes of a re-do; it also takes full advantage of the dramatic landscape and will give visiting golfers enough hole-to-hole variety to fill a multi-day stay at a nearby B&B or resort — Lutsen Resort is right across the road and the popular art-and-restaurant enclave of Grand Marais is 20 minutes away. The course’s owners brought in Texas-based but Midwest-bred Jeffrey Brauer to oversee the River and Canyon nines’ $4.6 million renovation. Best known for his award-winning work at three other Northern Minnesota gems — The Wilderness at Fortune Bay in Tower and both Giants Ridge Courses in Biwabik, all a couple hours’ trek west via off-the-grid state highways — Brauer’s team widened fairways, increased green sizes, built five new tees on each nine and filled bunkers with bright white Ohio sand. It all adds up to a friendlier golf experience, but by no means a pushover. Tee shots to the proper side of landing areas are vital to keep a ball from bounding into dense foliage, and to leave a favorable approach angle. And once you’re on the green — many of them elevated or tucked into tight, forested corners — reading them is, again, akin to mountain golf, with putts almost invariably breaking to the lake. The upside? That huge, glacier-formed body, which contains 10 percent of the world’s fresh water, is always easy to locate. 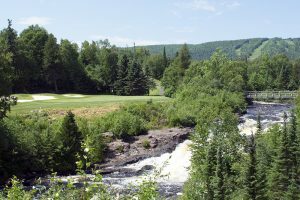 In a part of Minnesota where outdoor recreation reigns for thousands of visitors each year, Superior National satisfies that golf itch most of us can’t escape no matter how deep into the woods we go. Its remoteness just makes it that much more attractive. Greens fees for 18 holes with cart range from $45 to $69 depending on season and stay-play packages with a dozen nearby resorts, hotels and lodges are available.